Sir George Cayley is one of the most important people in the history of aeronautics. Many consider him the first true scientific aerial investigator and the first person to understand the underlying principles and forces of flight. His built his first aerial device in 1796, a model helicopter with contra-rotating propellers. Three years later, Cayley inscribed a silver medallion (above) which clearly depicted the forces that apply in flight. On the other side of the medallion Cayley sketched his design for a monoplane gliding machine. In 1804 Cayley designed and built a model monoplane glider of strikingly modern appearance. The model featured an adjustable cruciform tail, a kite-shaped wing mounted at a high angle of incidence and a moveable weight to alter the center of gravity. It was probably the first gliding device to make significant flights. 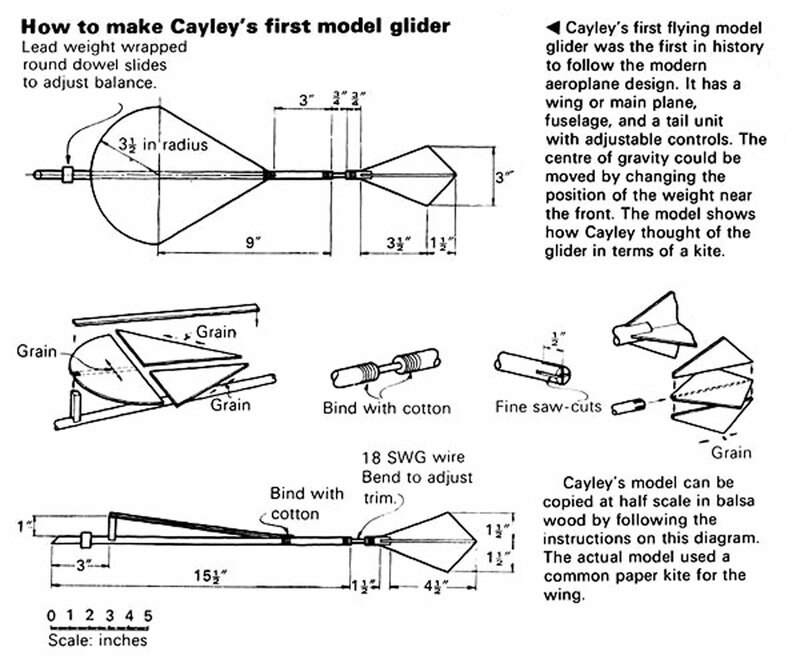 The following year Cayley discovered that dihedral (wings set lower at their center and higher at their outer ends) improved lateral stability. He continued his research using models and by 1807 had come to understand that a curved lifting surface would generate more lift than a flat surface of equal area. By 1810 Cayley had published his now-classic three-part treatise “On Aerial Navigation” which stated that lift, propulsion and control were the three requisite elelments to successful flight, apparently the first person to so realize and so state. By 1816 Cayley had turned his attention to lighter-than-air machines and designed a streamlined airship with a semi-rigid structure. He also suggested using separate gas bags to limit an airship’s lifting gas loss due to damage. In 1837 Cayley designed a streamlined airship to be powered by a steam engine. In 1849 Cayley built a large gliding machine, along the lines of his 1799 design, and tested the device with a 10-year old boy aboard. The gliding machine carried the boy aloft on at least one short flight.